Walter Hussey was a theologian engaging with the arts well before it became fashionable to do so. During his time at Chichester Cathedral, he commissioned artists such as Henry Moore and Graham Sutherland, much to the chagrin of his congregation and the wider community. When he commissioned Moore and Sutherland, they weren’t the big names that we now know them to be. What drew Hussey to their work was an integrity he saw that he thought better expressed the Christian faith than what was currently on offer. What intrigues me about Hussey is that he seems to be propelled by a vision of the role that both the Church and the art play in society at large. Art is not just for didactic or illustrative means. Nor does the Church exist merely as a cultural artifact. The Church has a responsibility to speak into and over the storms of reality … and the art that it commissions is the means by which that message is heard. For Hussey, art in the Church was bigger than just mere decoration. It was redemptive and restorative for a society that was decimated by World War II. Art had the potential to be more than a salve that covered over deep hurt and loss with sentimental offerings. Art was to be a response to reality and remind the viewer of God’s existence within it. That was mid-twentieth century Britain. What now? To what extent can the Church carry forward Hussey’s vision into a society riddled with fears of global recession, on-going war and terrorism, environmental disasters and climate change? What does it look like for art to be the Church’s mouthpiece? 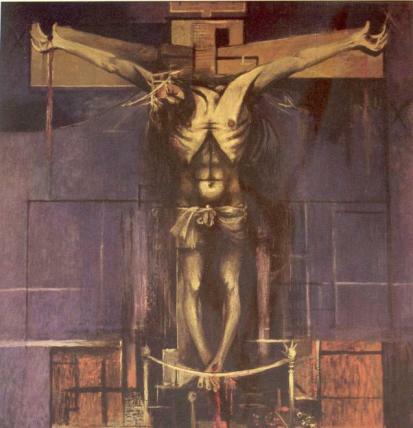 To the left is Graham Sutherland’s response in 1946 – a crucifixion that was able ‘to tell…somebody who had been in Belsen concentration camp that Christ knew about and had experienced human suffering.’ What’s ours? * Quotes taken from Graham Howes, The Art of the Sacred (London: I.B.Tauris & Co, 2007), 71, 73. Thanks for the post, Sara, and I love the imagery of the church shouting over the thunderstorms with art. In connection with my last post, do you think that one of the ways that the church can shout over the thunderstorm with art is through the creative design and construction of church buildings? And if so, is the power of the shout in the grandeur and stunning beauty, or in the way in which the building is a welcoming and peaceful place? Of course, these are not mutually exclusive, but I am just wondering the best way for church architecture to advance this purpose. I think so, Wes. Referring to your previous post, I think that in addition to the use of community-affirming and cost-responsible buildings, there is also something redemptive about using materials in a way that cares for creation. To me, it seems that what this world needs isn’t a shout of beauty from the heights of grandeur but a shout that invites them to be a part of the community. I wonder what Hussey would make of the blond Mary statue in Ely Cathedral? I think you raise some interesting points and you’ve certainly challenged me to think about the importance of recognising the pain and suffering of those who enter the church being reflected in the art commissioned or displayed in churches. it’s such an interesting inclusion in such a place that seems to have thought quite carefully and theologically about the way Art is incorporated. I agree — when I asked the tour guide about its inclusion, her response was that it was aligning with the tradition that Mary was blond. However, I think that part of my aversion to it stems from the wider environment it’s in. I found the windows in the chapel to let in too much light which then changed the feel of the room from one of contemplation to disengagement. A sense of disengagement was added to by the barren-ness of the room. I don’t remember anything else being in the chapel besides the altar and the statue. And then the way that David Wynne positioned her hands was distracting, reminding me more of signaling a touchdown rather than worship. All of those elements combined led me to feel like the work was trite. Do you think it would have been received differently if in a different context? Thanks Sara. I love the quote. It speaks so profoundly to the way that art can meet us in dark and difficult places, and help us to find the good that is in and beyond them. I am curious about the dichotomy (or distinction?) that appears to be operating beneath Hussey’s quote: the difference between Art and kitsch. It seems as though kitsch is being described as something impotent; something that cannot shout above the thunderstorm. I suppose this has a great deal of truth to it, but I wonder if we always need to be shouting above the thunderstorm. Is there a positive and valuable role for kitsch within the church, or in people’s lives in general? Is kitsch a fundamentally insipid form of art, or is it possible to describe it as a good thing when it is seen in its proper place? Good comments, Jim! You raise an interesting point. To add to it, I wonder how much our view of kitsch art is motivated by the elitism that has come about through modern art. But back to your question, I cautiously think that there is a role for kitsch (maybe I’m more influenced by the elitist mentality than I’d like to admit! )… Where I see kitsch playing an important role is in its accessibility and the resulting way that it’s able to move people to devotion (see David Morgan’s Visual Piety). But I suppose my concern would be whether or not kitsch only gives one perspective within a Christian context — would its proper place be alongside the kind of art that Hussey is speaking about, providing a balance?